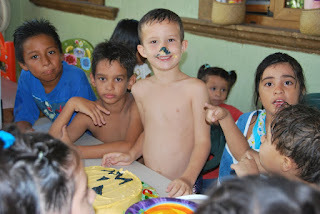 Puerto Morelos Blog: Photos from Caden's Birthday! It's been a couple of really busy weekends -- which means I am just now getting a chance to post photos of all of the events! First off, is my son, Caden's 6th Birthday Party. 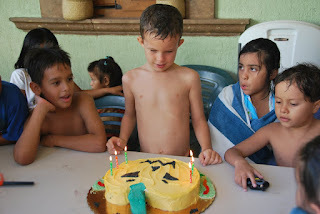 We invited all of his first grade classmates from his bi-lingual Puerto Morelos Elementary School, Humboldt -- plus some other neighborhood friends to our house for a pool party on Saturday, October 24th. They swam all afternoon. (I didn't know if the pool would ever recover, but has bounced back.) We grilled hot dogs, had great birthday cake, ice cream with Oreo Cookie "Dirt" and gummy worms, and uber yummy goul finger cookies made by my neighbor, Kathy! Here are some fun photos. 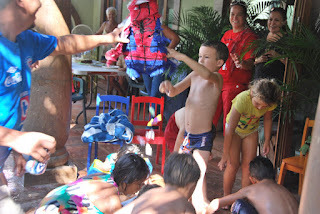 Of course, Caden had a Spiderman piñata! Caden's Jack-o-lantern Yummy Cake, made by Diane at Mama's Bakery! 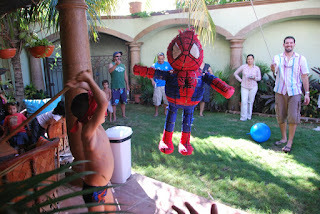 The Spiderman Piñata who was the toughest piñata that I've ever seen. He ended up headless, armless, and legless before he gave up the candy.